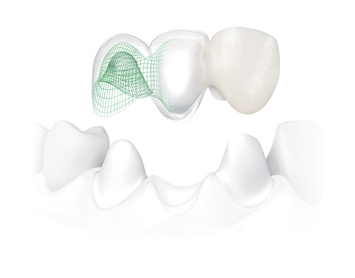 NobelProcera™ offers crown and bridges in zirconia, alumina, and titanium. Zirconia is available in four shades: white, light, medium and intense. Alumina is available in two shades:white and translucent. The preservation and restoration of natural teeth with crowns, ridges and laminates is the daily business of dental professionals. For natural teeth, NobelProcera offers a complete range of prosthetics which demonstrates excellence in precision of fit, biocompatibility and esthetics. NobelProcera offers crown and bridges in zirconia, alumina, and titanium. Zirconia is available in four shades: white, light, medium and intense. Alumina is available in two shades: white and translucent. NobelProcera bridges on natural teeth are custom designed, all-ceramic, restorations, milled from pre-sintered blanks of zirconia and /or alumina. The material homogeneity of these blanks delivers maximum biomechanical strength and allows for high precision of fit, which assist in providing optimal soft tissue support and esthetics. NobelProcera Bridge Zirconia are available in full arches (up to 14 units), whereas NobelProcera Bridge Alumina is perfectly suited for anterior use, up to 4 units. All tooth-supported crowns and bridges follow conventional cementation techniques. NobelProcera products on teeth and implants are guaranteed for five years; the NobelProcera Product Warranty only covers the NobelProcera products and does not include any additional costs. NobelProcera™ CAD/CAM – Precise, Fast, Cost-Efficient. Takes an impression using conventional procedures. Fabricates the model and a wax setup if needed. Scans the model and wax setup with the NobelProcera™ Scanner. The NobelProcera™ Scanner uses unique conoscopic technology for high accuracy. Designs the requested product with ease and speed in the NobelProcera™ Software – from simple to the most complex cases. The design is sent straight from the NobelProcera™ Software via the Internet to a NobelProcera™ production facility. Produces the product according to the CAD data sent by the dental laboratory by means of computer-assisted manufacturing. Finalizes the restoration and sends it to the restorative clinician.